I grew up in a family of storytellers, but the best storyteller by far was my grandfather, Nikola. A shy and tender man, always a perfect gentleman, he entertained his grandchildren with stories and wondrous recitals of Serbian epic poetry. Every story and poem he told us was from memory. I never saw him read a book but I know that my love of books and literature descend directly from the creative mind of this gentle man. 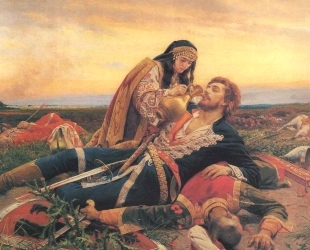 My earliest memories are of us (a number of very young grandchildren) begging our grandfather to tell us a fable or recite a poem about the heroic battles of the glorious Serbs fighting the Ottoman Turks. My grandfather loved children and even when he was extremely busy with the work of running a farm and taking care of his land, I never remember him refusing our requests. Grandfather made a magical game out of every experience. On the spacious veranda of his old house, he would set little stools in a circle for us to sit on, settle in the middle of our group and start a poem. Transported in a second, we left the village on the wings of my grandfather’s rhymes and floated to the heroic adventures of Serbian medieval warriors. Knights, ladies, silk gowns, gold, honor, swords, betrayal, vengeance, family, friendship, pride, love, death, Serbian valor, Turkish valor, history, Kosovo – those are the topics that fired our young imaginations. Told from memory, in predictable and well ordered rhyme, we knew all those poems by heart ourselves without even noticing that we have learned them. They are still with me. They never left. Kossanchitch, and young Toplitza Milan. “Unto whom shall this my cup be emptied? I can surely pledge no other hero. To thy health, oh Milosh, friend and traitor! Friend at first, but at the last a traitor. And wilt join the Turkish Sultan, Murad! But for those thy words I do not thank thee. Never have I been, and never will be. For the Christian faith to fight and perish. ’Tis Vuk Brankovitch, th’ accurséd traitor! Who to thee is faithful, and who faithless. This is a fragment of a famous epic poem about the “Last Supper” set on eve of the battle of Kosovo. The translation does not do it justice, but it is the best I could find.